The latest advances in technologies and networks have been central to the expansion of electronic content across different contexts. Contemporary communication approaches are crossing boundaries as new media are offering both challenges and opportunities. The democratisation of the production and dissemination of information via the online technologies has inevitably led individuals and organisations to share content (including images, photos, news items, videos and podcasts) via the digital and social media. Interactive technologies are allowing individuals and organisations to co-create and manipulate electronic content. At the same time, they enable them to engage in free-flowing conversations with other online users, groups or virtual communities (Camilleri, 2017). Innovative technologies have empowered the organisations’ stakeholders, including; employees, investors, customers, local communities, government agencies, non-governmental organisations (NGOs), as well as the news media, among others. Both internal and external stakeholders are in a better position to scrutinise the organisations’ decisions and actions. For this reason, there is scope for the practitioners to align their corporate communication goals and activities with the societal expectations (Camilleri, 2015; Gardberg & Fombrun, 2006). Therefore, organisations are encouraged to listen to their stakeholders. Several public interest organisations, including listed businesses, banks and insurance companies are already sharing information about their financial and non-financial performance in an accountable and transparent manner. The rationale behind their corporate disclosures is to develop and maintain strong and favourable reputations among stakeholders (Camilleri, 2018; Cornelissen, 2008). The corporate reputation is “a perceptual representation of a company’s past actions and future prospects that describe the firm’s overall appeal to all of its key constituents when compared to other leading rivals” (Fombrun, 1996). Business and media practitioners ought to be cognisant about the strategic role of corporate communication in leveraging the organisations’ image and reputation among stakeholders (Van Riel & Fombrun, 2007). They are expected to possess corporation communication skills as they need to forge relationships with different stakeholder groups (including employees, customers, suppliers, investors, media, regulatory authorities and the community at large). They have to be proficient in specialist areas, including; issues management, crises communication as well as in corporate social responsibility reporting, among other topics. At the same time, they should be aware about the possible uses of different technologies, including; artificial intelligence, augmented and virtual reality, big data analytics, blockchain and internet of things, among others; as these innovative tools are disrupting today’s corporate communication processes. This publication shall present the academics’ conceptual discussions that cover the contemporary topic of corporate communication in a concise yet accessible way. Covering both theory and practice, this publication shall introduce its readers to the key issues of strategic corporate communication as well as stakeholder management in the digital age. This will allow prospective practitioners to critically analyse future, real-life situations. All chapters will provide a background to specific topics as the academic contributors should feature their critical perspectives on issues, controversies and problems relating to corporate communication. This authoritative book will provide relevant knowledge and skills in corporate communication that is unsurpassed in readability, depth and breadth. At the start of each chapter, the authors will prepare a short abstract that summarises the content of their contribution. They are encouraged to include descriptive case studies to illustrate real situations, conceptual, theoretical or empirical contributions that are meant to help aspiring managers and executives in their future employment. In conclusion, each chapter shall also contain a succinct summary that should outline key implications (of the findings) to academia and / or practitioners, in a condensed form. This will enable the readers to retain key information. This textbook introduces aspiring practitioners as well as under-graduate and post-graduate students to the subject of corporate communication – in a structured manner. More importantly, it will also be relevant to those course instructors who are teaching media, marketing communications and business-related subjects in higher education institutions, including; universities and colleges. It is hoped that course conveners will use this edited textbook as a basis for class discussions. Senior and junior academic researchers are invited to submit a 300-word abstract on or before the 30th June 2019. Submissions should be sent to Mark.A.Camilleri@um.edu.mt. Authors will be notified about the editorial decision during July 2019. The length of the chapters should be between 6,000- 8,000 words (including references, figures and tables). These contributions will be accepted on or before the 31st December 2019. The references should be presented in APA style (Version 6). All submitted chapters will be critically reviewed on a double-blind review basis. The authors’ and the reviewers’ identities will remain anonymous. All authors will be requested to serve as reviewers for this book. They will receive a notification of acceptance, rejection or suggested modifications – on or before the 15th February 2020. Note: There are no submission or acceptance fees for the publication of this book. All abstracts / proposals should be submitted via the editor’s email. Following the double-blind peer review process, the full chapters will be submitted to Springer Nature for final review. For additional information regarding the publisher, please visit https://www.springer.com/gp. This prospective publication will be released in 2020. Fombrun, C.J. (1995). Reputation: Realizing Value from the Corporate Image. Cambridge, MA, USA: Harvard Business School Press. The latest disruptive technologies are supporting the marketing mix elements as they can improve the businesses’ interactive engagement with prospective customers, and enhance their personalization of services. They may also provide secure pricing options. Many firms are evolving from their passive, rigid, and product-centric state to a more flexible, dynamic, and customer-centric environment. Technology is enabling data-driven companies to monitor and detect any changes in consumer sentiment. Savvy technology giants including Facebook, Amazon, Microsoft and Google are capturing (and analyzing) the online and mobile activity of prospective customers. Their analytics captures the consumers’ interactions with brands and companies through digital media. Big data is enabling them to target and re-target individu­als and online communities with instantaneous pricing and access options, across multiple channels (via web-site activity, mobile,video, social media, e-commerce, among others). Mobile tracking technologies are being utilized by big technology conglomerates as they gather information on the consumer behaviours, including their shopping habits, lifestyle preferences , et cetera. Businesses have learnt how to take advantage of on-demand, real-time information from sensors, radio frequency identification and other location tracking devices to better understand their marketing environments at a more granular level (Storey and Song, 2017). This way business could come up with personalised products and services, that are demanded by individual customers. From a business perspective, it is important to acquire this data, quickly, and in high velocities. Many businesses are already benefiting of the programmatic advertising environment; where buyers and sellers of digital advertising connect online to exchange available inventory (Busch,2016; Stevens et al., 2016). The challenge for tomorrow’s businesses is to recognize the value of smart technologies as effective tools that can help them analyse their marketing environment; that comprise their customers as well as their competitors. The predictive-analytical tools can examine different scenarios as they can anticipate what will happen, when it will happen, and can explain why it happens. These technologies can monetise data by identifying revenue generating opportunities and cost savings. Other innovations, including; blockchain’s distributed ledger technologies are improving data privacy. This technology involves the verification and the secure recording of transactions among an interconnected set of users. Blockchain tracks the ownership of assets before, during, and after any online transaction. Therefore, this technology could be used by different businesses to facilitate their transactions with marketplace stakeholders, including; suppliers, intermediaries, and consumers across borders. The block chain will probably be more convenient than other payment options, in terms of time and money. Therefore, blockchain’s ledger technology can possibly lead to better customer service levels and operational efficiencies for businesses. The smart tourism technologies, including big data analytics are shifting how organisations collect, analyze and utilise and distribute data. A thorough literature review suggests that the crunching of big data analytics is generating meaningful insights and supporting tourism marketers in their decision making. Moreover,other technologies, including the programmatic advertising and block chain are helping them to improve their financial and strategic performance, whilst minimizing costs. Table 1 illustrates how smart tourism businesses are capturing, analysing and distributing data. Tomorrow’s tourism businesses will be serving customers from geographically-diverse regions. There will be more travellers from emerging markets and developing economies. The tourism service providers will have to cater to different demographics, including senior citizens and individuals with special needs; as the populations are getting older in many countries. Therefore, smart technologies can be used to anticipate the discerned consumers’ requirements. For instance, the use of programmatic advertising will probably increase the individuals’ intuitive shopping experiences and can tap into the individuals’ discretionary purchases. It is very likely, that the third-party retailers will continue to form part of the distribution mix. However, many service providers will be using their direct channels to reach out to their targeted customers. The sales of products will continue to rely on mobile devices with increased consumer interactions through speech and voice recognition software. The service providers may possibly rely on artificial intelligence and other forms of cognitive learning capabilities, like machine learning and deep learning. The businesses’ distributive systems could interface with virtual reality software to help online intermediaries to merchandise their products in captivating customer experiences. Many online prospects may use blockchain’s secure technology to purchase tourism products, in the foreseeable future. This contribution calls for further empirical research that could explore smart tourism innovations for individuals and organisations, including; mobile social networking, mobile visualisation, personalization and behavioural modelling for mobile apps, programmatic advertising, blockchain, AI, and the internet of things, among other areas. Busch, O. (2016), “The programmatic advertising principle”, In Programmatic Advertising (pp. 3-15). Springer, Cham, Switzerland. Camilleri, M.A. (2018) Data-Driven Marketing and Disruptive Technologies. Working Paper 08/2018, Department of Corporate Communication, University of Malta. Stevens, A., Rau, A., and McIntyre, M. (2016), “Integrated campaign planning in a programmatic world”, In Programmatic Advertising (pp. 193-210), Springer, Cham, Switzerland. Storey, V. C., and Song, I. Y. (2017), “Big data technologies and Management: What conceptual modeling can do?”, Data and Knowledge Engineering, Vol. 108, pp. 50-67. An Excerpt from my latest paper: Camilleri, M.A. (2018). The SMEs’ Technology Acceptance of Digital Media for Stakeholder Engagement. Journal of Small Business and Enterprise Development (Forthcoming). This contribution sheds light on the SME owner-managers’ attitudes toward the pace of technological innovation, perceived use and ease of use of digital media; as they communicate and interact with interested stakeholders online. It also explored their stance on responsible entrepreneurship, specifically on commercial, ethical and social responsibilities, as well as on their willingness to support other responsible stakeholders. This empirical study and its theoretical underpinnings contribute to an improved understanding as to why today’s SMEs are expected to communicate with stakeholders through digital media. At the same time, it raises awareness of responsible entrepreneurial initiatives that could be promoted through digital media, including; corporate websites, social media and blogs, among others. Generally, the results reported that there were high mean scores and low standard deviations, particularly when the participants were expected to indicate their attitudes on their commercial and ethical responsibilities. The nature of the SMEs’ CSR activities is usually integrated into their company culture, often implicitly in habits and routines that are inspired by highly motivated owner-managers; rather than explicitly in job descriptions or formalized procedures (Jenkins, 2006). The factor analysis indicated that the SME owner-managers were increasingly perceiving the usefulness of digital media to engage with marketplace stakeholders, including; consumers, suppliers and other businesses, as they promoted their responsible entrepreneurship behaviors. The communications on their businesses’ social responsibility and environmentally-sound practices also served them well to engage with other interested groups; including; human resources, shareholders and investors, among others. This finding mirrors Baumann Pauly et al.’s (2013) argumentation as these authors remarked that each business decision on economic, social, and environmental aspects must take into account all stakeholders. Notwithstanding, the businesses and their marketers need to possess relevant knowledge on their stakeholders, as this will impact on the effectiveness of their CSR communication (Morsing and Schultz, 2006; Vorvoreanu, 2009). The value of their communications lies in their ability to open-up lines of dialogue through stories and ideas that reflect their stakeholders’ interests (Fieseler and Fleck, 2013; Moreno and Capriotti, 2009). For these reasons, companies cannot afford to overstate or misrepresent their CSR communications. Their online communication with stakeholders could foster positive behaviors or compel remedial actions, and will pay off in terms of corporate reputation, customer loyalty and market standing (Tantalo and Priem, 2016; Du et al, 2010). This study suggests that the SME owner-managers were recognizing that they had to keep up with the pace of technological innovation. Yet there were a few participants, particularly the older ones, who were still apprehensive toward the use of digital media. Eventually, these respondents should realize that it is in their interest to forge relationships with key stakeholders (Lamberton and Stephen, 2016; Taiminen and Karjaluoto, 2015; Rauniar et al., 2014; Uhlaner et al., 2004). This research posits that the owner-managers or their members of staff should possess relevant digital skills and competences to communicate online with interested parties. Likewise, Baumann Pauly et al., (2013) also recommended that the managers must be trained, and that their CSR activities must be evaluated. These findings are in line with other contributions (Spence and Perrini, 2011; Perrini et al., 2007) that have theoretically or anecdotally challenged the business case perspective for societal engagement (Penwar et al., 2017; Baden and Harwood 2013; Brammer et al. 2012). The regression analysis has identified and analyzed the determinants which explain the rationale behind the SME owner-managers’ utilization of digital media for stakeholder engagement and for the promotion of responsible entrepreneurship. It reported that the respondents’ technology acceptance depended on their perceived “use” and “ease of use” of digital media; and on their willingness to communicate online on their commercial, ethical and social responsibilities. The results from the regression analysis reported positive and significant relationships between the SMEs’ online stakeholder engagement and the pace of technological innovation; and between the SMEs’ online engagement and the owner-managers’ perceived usefulness of digital media. This study indicated that the pace of technological innovation, the owner-managers’ perceived ease of use of the digital media, as well as their commercial responsibility were significant antecedents for their businesses’ online communication of their responsible behaviors. Arguably, the use of technology is facilitated when individuals will perceive its usefulness and its ease of use (Davis, 1989). In fact, the findings from this research have specified that the owner-managers’ intention was to use digital media to communicate about their responsible entrepreneurship. They also indicated their desire to use this innovation to engage with stakeholders on other topics, including commercial and ethical issues. This is in stark contrast with Penwar et al.’s (2017) findings, as the authors contended that the SME owner-managers’ perceptions on social engagement did not hold the same virility when compared to the context of their larger counterparts. These authors argued that the tangible benefits of CSR engagement had no effect on SMEs. In a similar vein, Baumann Pauly et al.’s (2013) study reported that the larger businesses were more effective than SMEs in their CSR communications. equations indicated that the small and micro businesses were using digital media to improve their stakeholder engagement and to communicate about their responsible entrepreneurship issues. SME managers and executives are in a position to enhance the effectiveness of their businesses’ communication efforts. This study has identified and analyzed the SME owner-managers’ attitudes toward the utilization of digital media for the communication of commercial, ethical and social responsibility issues. 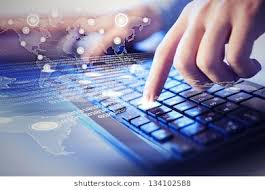 Previous academic research has paid limited attention to the technology acceptance of digital media among small businesses, albeit a few exceptions (Taiminen and Karjaluoto, 2015; Baumann Pauly, Wickert, Spence and Scherer, 2013; Durkin et al., 2013; Taylor and Murphy, 2004). In this case, the research findings indicated that digital technologies and applications were perceived as useful by the SME owner-managers. This implies that the utilization of digital media can be viewed as a critical success factor that may lead to an improved engagement with stakeholders. Several SMEs are already communicating about their responsible entrepreneurship through conventional and interactive media, including; social media, review sites, blogs, et cetera. These savvy businesses are leveraging their communications as they utilize digital media outlets (e.g., The Guardian Sustainability Blog, CSRwire, Triple Pundit and The CSR Blog in Forbes among others) to improve their reach, frequency and impact of their message. In addition, there are instances where consumers themselves, out of their own volition are becoming ambassadors of trustworthy businesses on digital media (Du et al., 2010). Whilst other stakeholders may perceive these businesses’ posturing behaviors and greenwashing (Camilleri, 2017; Vorvoreanu, 2009). A thorough literature review suggested that the positive word-of-mouth publicity through digital media may lead to strategic and financial benefits (Camilleri, 2017; Taiminen and Karjaluoto, 2015; Durkin et al., 2013). Therefore, businesses, including SMEs, are increasingly joining conversations in social media networks and online review sites. These sites are being used by millions of users every day. Indeed, there is potential for SMEs to engage with their prospects and web visitors in real-time. The latest disruptive technologies are supporting the tourism businesses’ marketing mix elements as they improve the interactive engagement with individual prospects, enhance the personalisation of services, whilst providing secure pricing options. Many tourism firms are evolving from their passive, rigid, and product-centric state to a more flexible, dynamic, and customer-centric environment, as they monitor and detect any changes in consumer sentiment. Data-driven companies are increasingly capturing and analysing the online and mobile activity of prospective customers, as they delve into ecommerce and review sites, personal blogs and social media (Sigala, 2017; Kumar et al., 2017). Their analytics captures the consumers’ interactions with brands and companies through digital media. Therefore, big data is enabling them to target and re-target individuals and online communities with instantaneous pricing and access options, across multiple channels (via web-site activity, mobile, video, social media, ecommerce, among others). Large technology giants use mobile tracking technologies, to gather information on the consumer behaviours, including their shopping habits, lifestyle preferences , et cetera (Aksu et al., 2018). Tech-savvy firms have learnt how to take advantage of on-demand, real-time information from sensors, radio frequency identification and other location tracking devices to better understand their marketing environments at a more granular level (Storey & Song, 2017). This way business could come up with personalised products and services, that are demanded by individual customers (Li et al., 2017). From a business perspective, it is important to acquire this data, quickly, and in high velocities. This paper reported that many businesses are already benefiting of the programmatic advertising environment; where buyers and sellers of digital advertising connect online to exchange available inventory (Busch, 2016; Stevens et al., 2016). The challenge for tourism businesses is to recognise the value of smart technologies as effective tools that can analyse their marketing environment, including the customers as well as their competitors. The predictive-analytical tools can examine different scenarios; and the prescriptive analytics anticipate what will happen, when it will happen, and explains why it happens. These technologies can monetise data by identifying revenue generating opportunities and cost savings. Other innovations, including blockchain’s distributed ledger technologies are improving data privacy, as it involves the verification and the secure recording of transactions among an interconnected set of users. Blockchain tracks the ownership of assets before, during, and after any online transaction. Therefore, this technology could be used by tourism businesses to facilitate their transactions with marketplace stakeholders, including suppliers, intermediaries, and consumers across borders. The block chain will probably be more convenient than other payment options, in terms of time and money. Therefore, blockchain’s ledger technology can possibly lead to better customer service levels and operational efficiencies for the tourism businesses. The smart tourism technologies, including big data analytics are shifting how organisations collect, analyse and utilise and distribute data. A thorough literature review suggests that the crunching of big data analytics is generating meaningful insights and supporting tourism marketers in their decision making. Moreover, other technologies, including the programmatic advertising and blockchain’s distributed ledger system is helping them to improve their financial and strategic performance. In conclusion, this contribution calls for further research on data-driven tourism. This authoritative book was edited by Mark Anthony Camilleri. It provides students and practitioners with a good understanding of different tourism products, marketing strategies and tactics on destination branding, as well as useful insights on sustainable and responsible tourism practices, among other topics. The readers are equipped with a strong pedagogical base on the attractiveness of tourist destinations as this publication presents contemporary conceptual discussions and empirical studies on several aspects of destination branding. Tourism marketers, including destination management organizations (DMOs) are formulating strategies and tactics to attract prospective visitors. Hence, this book also sheds light on the latest industry developments in travel, tourism, hospitality and events in different contexts around the world. Chapter 1 introduces the readers to different aspects of the travel, tourism, hospitality and leisure industries, including; the visitors’ accessibility, accommodation, attractions, activities and amenities. The author explains how tourist destinations are capable of customizing their products to customer segments and individuals, by offering; adventure tourism, business tourism (including meetings, incentives, conferences and events), culinary tourism, cultural (or heritage) tourism, eco-tourism (or sustainable tourism), educational tourism, health (or medical tourism), religious tourism, rural tourism, seaside tourism, sports tourism, urban (or city) tourism, wine tourism, among other niche areas. 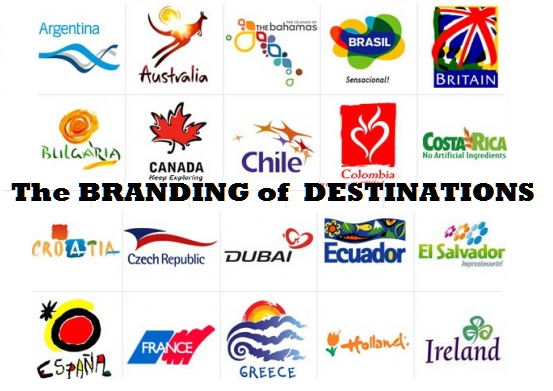 Chapter 2 provides an explanation of destination marketing, place branding and their related notions. The authors critically review the conceptual developments on the branding of tourist destinations. Chapter 3 suggests that destination management organisations ought to engage in fruitful relationships with internal and external stakeholders. The authors maintain that there are several factors that can affect the strategic management of these organisations. Chapter 4 explores how Sweden is branding its destinations by improving its cultural identify and by providing multi-sensory experiences to its visitors. Chapter 5 sheds light on the agritourism businesses in Italy’s Campania region. The author analyses the main critical success factors for a thriving rural tourism market. Chapter 6 explains the key elements of cultural tourism, including the destination’s heritage, lifestyle, and “Made in Italy”. The authors put forward a tourism development model. They suggest that it represents a functional framework for the benefit of tourism practitioners. Chapter 7 explores the consumer-based brand equity of events. The authors explain how the organization of events, including music festivals could add value to the destinations’ image. They imply that the visitors’ positive experiences and their word-of-mouth publicity can contribute to the destinations’ branding. Chapter 8 explores the destination branding of Porto in Portugal. The authors analyze the visitors’ attitudes on Porto’s largest wine festival. They assess their visitors’ level of satisfaction with the event and their intention to return. Chapter 9 identifies the key elements that serve as drivers for the development of oleotourism in Jaen, Spain. The authors suggest that there is scope in stakeholder engagement amongst the main actors and drivers in the sector. Chapter 10 investigates the environmental behaviour of three-, four- and five-star hotels in Azuay, Ecuador. The authors explored the relationship between environmental responsibility and stakeholder engagement. Their findings suggest that the hotel managers strive in their endeavours to implement responsible environmental practices to avoid regulatory pressures. Chapter 11 examines the relationship between the destinations’ image and brand equity. The author contends that the tourists’ hedonic and monetary values can have a moderating effect on the country-of-origin’s image and brand extension. Chapter 12 investigates the relationship between the customers’ satisfaction, commitment, trust and loyalty toward hospitality brands. It develops and empirically test the social identity construct (customer brand identification and other critical social exchange constructs (satisfaction, trust, commitment). This publication was written by academics for other scholars, researchers, advanced under-graduate and post-graduate students. However, it is also relevant to the industry practitioners, including consultants, senior executives and managers who work for destination management organizations, tourism offices, hotels, inbound / outbound tour operators and travel agents, among others. The book explains all the theory and the empirical studies in a simple and straightforward manner. It describes the various marketing environments that comprise a wide array of economic, socio-cultural and environmental realities. “Tourism Planning and Destination Marketing” was recently edited by Dr. Mark Anthony Camilleri, Ph.D. (Edinburgh). This publication is written in an engaging style to entice the curiosity of its readers. It presents all the theory and the empirical studies in a simple and straightforward manner. It reports on the global tourism marketing environments that comprise a wide array of economic, socio-cultural and environmental issues. It also explains how ongoing advances in technology are bringing interesting developments in the tourism industry and its marketing mix. This authoritative book provides theoretical and empirical insights on different tourism topics, including; destination marketing and branding, sustainable and responsible tourism, tourism technologies, digital marketing, travel distribution and more. It is also relevant to the industry practitioners, including consultants, senior executives and managers who work for destination management organisations, tourism offices, hotels, inbound / outbound tour operators and travel agents, among others. The marketing of a destination relies on planning, organisation and the successful execution of strategies and tactics. Therefore, this authoritative book provides students and practitioners with relevant knowledge of tourism planning and destination marketing. The readers of this publication are equipped with a strong pedagogical base as they are presented conceptual discussions as well as empirical studies on different aspects of the travel and tourism industries. The readers of this book will acquire a good understanding of the tourism marketing environment, destination branding, distribution channels, etourism, as well as relevant details on sustainable and responsible tourism practices, among other topics. They will appreciate that the tourism marketers, including destination management organisations (DMOs) are increasingly using innovative tools, including; digital media and ubiquitous technologies to engage with prospective visitors. Hence, this book also sheds light on contemporary developments in travel, tourism, hospitality, festivals and events. Chapter 1 introduces the readers to the tourism concept as it describes the travel facilitators and motivators. Afterwards, it explains several aspects of the tourism product, including; the visitors’ accessibility, accommodation, attractions, activities and amenities. It categorises different travel markets; including; adventure tourism, business tourism (including meetings, incentives, conferences and events), culinary tourism, cultural (or heritage) tourism, eco-tourism (or sustainable tourism), educational tourism, health (or medical tourism), religious tourism, rural tourism, seaside tourism, sports tourism, urban (or city) tourism, wine tourism, among other niche areas. Chapter 2 offers a critical review and analysis of relevant literature on the tourism product’s experiential perspective. The authors suggest that the customers’ experience is affected by cognitive, emotional, relational and sensorial aspects. Chapter 3 examines Plog’s model of venturesomeness. The author provides a thorough review of 26 studies that have adopted this behavioural model. He maintains that this model could be used to identify the travellers’ psychographic characteristics as he correlates them with the destinations they visit. Chapter 4 focuses on the coopetition features of tourism destinations. The author held that (competing) tourism service providers, including destination marketing organisations often cooperate to deliver positive customer experiences. In addition, he explained how seasonality and colocation issues can influence specific features of coopetition and collaborative practices in tourism destinations. Chapter 5 explored the residents’ attitudes towards incoming tourism at Punta del Este, Uruguay. The authors suggest that the respondents were perceiving economic benefits from increased tourism figures. However, the same respondents indicated that they were aware about the socio-cultural costs of tourism. Chapter 6 appraises the notions of sustainable and responsible tourism. It traces the origins of the concept of sustainable development and includes a critical review of key theoretical underpinnings. The author provides relevant examples of the social, environmental and economic impacts of tourism in vulnerable or sensitive climates. Chapter 7 investigates the tourists’ experiences of Japan’s Tateyama and Hirakawa rural areas. The author suggests that the tourists’ experience of rural tourism has led them to appreciate the Japanese culture. Chapter 8 sheds light on the eco-tourism concept. Following a thorough literature review, the authors imply that the service providers ought to identify their visitors’ motivation for eco-tourism destinations. Chapter 9 clarifies how emerging technologies, including; augmented reality (AR) and virtual reality (VR) are being used in the travel and tourism industries. The authors introduce the readers to the term, “phygital” as they argue that the tourists are seeking physical and virtual experiences. They suggest that AR and VR have the power to blend together the individuals’ perception of real and virtual spaces. Chapter 10 explains the importance of organising events for destination marketing. The authors suggest that festivals and events can create a positive image of a destination. The destinations’ ongoing activities may lead to economic benefits to tourism operators as well as to the community, at large. Chapter 11 posits that the destinations marketers ought to formulate their strategies prior to the planning and organising of events. The author contends that the effective management of events relies on stakeholder engagement, attracting sponsorships and the use of interactive media. Chapter 12 describes Smart Tourism Local Service Systems (S-TLSS) that are intended to facilitate the engagement among various stakeholders. The authors suggest that S-TLSS supports the tourism planning and destination marketing in Caserta, Italy. To be successful, companies must adapt to ongoing trends and developments in their macro and micro environments. Therefore, it is in the interest of organisations to scan their marketing environment to deal with any possible threats from the market and to capitalise on any available opportunities. This chapter explains the external environmental factors, including; political, economic, social and technological influences. It also considers the internal environmental factors, including; capital structures, resources, capabilities and marketing intermediaries; as it identifies competitive forces from differentiated or low-cost service providers. A sound knowledge of the customer requirements is an essential ingredient for a successful business. For this reason, companies should consistently monitor their marketing environment. The marketing environment is continuously changing, as it consists of a number of unpredictable forces which surround the company. The regulatory and competitive conditions as well as other market forces, including; political, economic, social and technological forces, could affect the organisational performance of the tourism businesses. Hence, this chapter will look into some of these issues. The tourism industry is highly influenced by economic factors, including; strong exchange rate fluctuations, the price of oil and other commodities, among other matters. Moreover, social factors including global concerns about safety and security could influence tourist behaviours. Notwithstanding, the regulatory environments will also have an impact on tourism and airline businesses. For instance, the airline industry’s deregulation and liberalisation has created numerous opportunities for many airlines, including low-cost carriers. At the same time, it has threatened inefficient airlines who have been protected by regulation. Competition is a vitally important element in the marketing environment and it should not be under-estimated. The businesses competitors comprise suppliers of substitute products. They may be new entrants in the marketplace. Alternatively, they may include customers and suppliers who were stakeholders of the business. In this light, tourism marketers should be knowledgeable of different business models as competition can take different forms, like for example, differentiated, full-service companies or low-cost service providers. For these reasons, organisations should have effective mechanisms to monitor the latest developments in the marketing environment. Environmental scanning entails the collection of information relating to the various forces within the marketing environment. This involves the observation and examination of primary and secondary sources of information, including online content from business, trade, media and the government, among others. The environmental analysis is the process of assessing and interpreting the information gathered. An ongoing analysis of the gathered data may be carried out by marketing managers or by researchers who have been commissioned to conduct market research (as explained in the previous chapter). Through analysis, marketing managers can attempt to identify extant environmental patterns and could even predict future trends. By evaluating trends and tendencies, the marketing managers should be able to determine possible threats and opportunities that are associated with environmental fluctuations. When discussing the ‘marketing environment’ we must consider both the external environment (i.e. the macro-environment) as well as the internal environment (i.e. the micro-environment) (Kotler, Armstrong, Frank & Bunn, 1990). The tourism businesses must constantly assess the marketing environment. It is crucial for their survival and achievement of their long-term economic goals. Therefore, marketing managers must engage in environmental scanning and analysis. Most firms are comfortable assessing the political climates in their home countries. However, the evaluation of political climates in foreign territories is far more problematic for them. Experienced international businesses engage in political risk assessment, as they need to carry out ongoing systematic analyses of the political risks they face in foreign countries. Political risks are any changes in the political environment that may adversely affect the value of any firm’s business activities. Most political risks may result from governmental actions, such as; the passage of laws that expropriate private property, an increase in operating costs, the devaluation of the currency or constraints in the repatriation of funds, among others. Political risks may also arise from non-governmental actions when there is criminality (for example: kidnappings, extortion and acts of terrorism, et cetera). Political risks may equally affect all firms or may have an impact on particular sectors, as featured hereunder. Non-governmental political risks should also be considered. For example, Disneyland Paris and McDonalds have been the target of numerous symbolic protests who view them as a convenient target for venting their unhappiness with US international agricultural policies. In some instances, protests could turn violent, and may even force firms to shut down their operations, in particular contexts. Expropriation Loss of future profits. Confiscation Loss of assets, loss of profits. Campaigns against businesses Loss of sales; increased costs of public relation; efforts to improve public image. Mandatory labour benefits legislation Increased operating costs. Kidnappings, terrorist threats and other forms of violence Increased security costs; increased managerial costs; lower productivity. Civil wars Destruction of property; lost sales; increased security costs. Repatriation Inability to transfer funds freely. Currency devaluations Reduced value of repatriated earnings. Increased taxation Lower after-tax profits. Camilleri, M. A. (2018). The Marketing Environment. In Travel Marketing, Tourism Economics and the Airline Product (pp. 51-68). Springer, Cham, Switzerland. Kotler, P., Armstrong, G., Franke, G., & Bunn, M.D. (1990). Marketing: An Introduction, Vol. 1. New Jersey: Prentice Hall. This an excerpt from my latest open-access paper in Springer’s Asian Journal of Sustainability and Social Responsibility. This review paper has built on the previous theoretical underpinnings of the corporate social responsibility agenda including Stakeholder Management, Corporate Citizenship and Creating Shared Value as it presents the latest Corporate Sustainability and Responsibility perspective. This value-based model reconciles strategic CSR and environmental management with a stakeholder approach to bring long term corporate sustainability, in terms of economic performance for the business, as well as corporate responsibility’s social outcomes. Recently, some international conferences including Humboldt University’s gatherings in 2014 and 2016 have also raised awareness on this proposition. The corporate sustainability and responsibility concept is linked to improvements to the companies’ internal processes including environmental management, human resource management, operations management and marketing (i.e. Corporate Sustainability). At the same time, it raises awareness on the businesses’ responsible behaviours (i.e. Corporate Responsibility) toward stakeholders including the government, suppliers, customers and the community, among others. 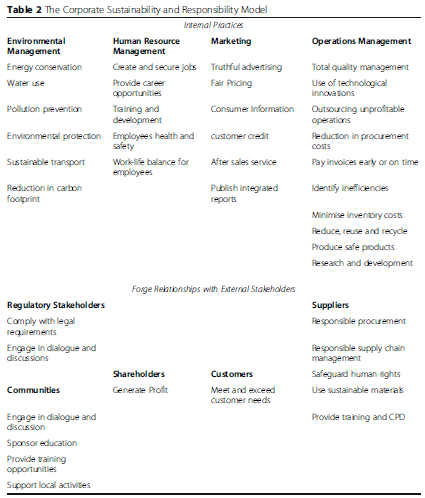 The fundamental motivation behind this approach is the view that creating connections between stakeholders in the value chain will open-up unseen opportunities for the competitive advantage of responsible businesses, as illustrated in Table 2. Corporate sustainability and responsibility focuses on exploiting opportunities that reconcile differing stakeholder demands as many corporations out there are investing in corporate sustainability and responsible business practices (Lozano 2015). Their active engagement with multiple stakeholders (both internal and external stakeholders) will ultimately create synergistic value for all (Camilleri 2017). Multinational organisations are under increased pressures from stakeholders (particularly customers and consumer associations) to revisit their numerous processes in their value chain activities. Each stage of the company’s production process, from the supply chain to the transformation of resources could add value to their businesses’ operational costs as they produce end-products. However, the businesses are always expected to be responsible in their internal processes toward their employees or toward their suppliers’ labour force. Therefore, this corporate sustainability and responsibility perspective demands that businesses create economic and societal value by re-aligning their corporate objectives with stakeholder management and environmental responsibility. In sum, corporate sustainability and responsibility may only happen when companies demonstrate their genuine willingness to add corporate responsible dimensions and stakeholder engagement to their value propositions. This occurs when businesses opt for responsible managerial practices that are integral to their overall corporate strategy. These strategic behaviours create opportunities for them to improve the well-being of stakeholders as they reduce negative externalities on the environment. The negative externalities can be eliminated by developing integrated approaches that are driven by ethical and sustainability principles. Very often, multinational businesses are in a position to mitigate risk and to avoid inconveniences to third parties. For instance, major accidents including BP’s Deep Horizon oil spill in 2010, or the collapse of Primark’s Rana Plaza factory in Bangladesh, back in 2013, could have been prevented if the big businesses were responsible beforehand. In conclusion, the corporate sustainability and responsibility construct is about embedding sustainability and responsibility by seeking out and connecting with the stakeholders’ varied interests. As firms reap profits and grow, there is a possibility that they generate virtuous circles of positive multiplier effects (Camilleri 2017). Therefore, corporate sustainability and responsibility can be considered as strategic in its intents and purposes. Indeed, the businesses are capable of being socially and environmentally responsible ‘citizens’ as they are doing well, economically. This theoretical paper has contributed to academic knowledge as it explained the foundations for corporate sustainability and responsibility. Although this concept is still evolving, the debate among academic commentators is slowly but surely raising awareness that are needed to deliver strategic results that create value for businesses, society and the environment. Lozano R (2015) A holistic perspective on corporate sustainability drivers. Corp Soc Responsib Environ Manag 22(1): 32-44. Many search engines are increasingly offering advantageous deals on travel products. Very often, they may have user-friendly websites that help individual consumers search for the best prices. For example, a flight search may include one-way, return or multiple destinations. The travellers may specify whether they would like to travel in a particular class of service (for example, economy, business or first class). Travellers may also opt for direct services (which are usually more expensive), and their search can be narrowed down according to their preferred departure and arrival times (if any). In addition, many search engines identify their “best flight” option. Their algorithm will usually base their decision on layover time, the length of flight, and departure/arrivals times. They may also let you know if there are cheaper flights available, particularly if there are nearby airports. Price Alerts: The search engines will enable their users to set a price alert on tourism products. For example, after the users have given details on the travel dates and their email address, they will receive regular emails which will communicate whether the price for the flight (that was searched through the search engines’ system) has gone up or down in price. Travel alerts are convenient for those passengers who are planning their itineraries in advance. Online prospects will be updated on the best time to purchase their flight (in this case). Flight Deal Websites: Online prospects can find good flight deals by following niche websites that are dedicated to posting such deals. Most of these websites may not necessarily be affiliated with any airline. Very often, consumers may check these websites on a regular basis. Alternatively, they may follow travel and tourism groups through social media. Flexibility: An inexpensive flight may not always be the right flight for passengers. The prospective customers may demand flexible dates. For instance, they may want to avoid unnecessary overnight stays in random cities (a hotel accommodation may well increase the cost of the travellers’ journey). Moreover, there are other important considerations. For example, customers may not be willing to travel to distant airports. They may not like to travel at night, et cetera. The best flight deals may not last long as search engines may frequently change their flight prices. Bonus Tip: Many low-cost carriers may not feature all costs in their prices. These “hidden” costs may comprise carry-on baggage fees, checked-baggage charges and seat fees. Customers should check these fees and charges before purchasing a flight with any airline. Such “hidden” costs and expenses are usually disclosed on the airlines’ respective websites. In many cases these supplementary fees can be paid in advance. If customers would not pay in anticipation of their flight, they may easily incur additional charges. Therefore, the overall best deal should be determined according to flight times, hidden costs, and personal airline preferences. The travel and tourism businesses are increasingly using corporate websites as they help them improve consumer leads and sales conversions. In addition, their clear, differentiated pricing information on service-tiers provide product options to online prospects. The tourism products ought to focus on the benefits they provide, by highlighting their value propositions; rather than simply illustrating their features. Despite the fact that so many transactions are carried out online, the travel websites could lack in their provision of personal interaction. This means that even the smallest thing that’s out of place on the ecommerce pages could possibly rapidly erode the customers’ trust in products and services. Therefore, tourism businesses could build consumer confidence and trust by using an SSL certificate to make transactions secure, particularly if they are processing credit cards. The travel businesses’ corporate websites are expected to articulate their terms and conditions, including any relevant cancellation and refund policies. They should also feature their contact details (including an address, telephone and emails) to customers and prospects. Many sites could offer live chat facilities on their site, to help online customers in their queries, or to address their concerns. If the businesses do not offer such interactions in real time, they still need acknowledge their online prospects’ message(s), and inform them that they will be responding to them in reasonable time. Moreover, the use of testimonials from consumers, including; reviews and ratings will serve as proof that the tourism business is providing an adequate level of service to customers. The positive experiences from customers themselves, will help to improve conversions and sales. The tourism web sites should underline the true benefits of their product. Hence, they should present relevant written content which will make the product stand out from the rest. In this day and age, attractive web sites should be well-designed to entertain visitors. The travel sites have to feature a good selection of images and videos. This allows prospective visitors to become familiar with the tourism product. Destination management organisations are increasingly allowing online visitors to zoom in high-res images and video clips in their websites. The interactive images and videos should load as quickly as possible. Any delays of even a couple of seconds would turn off dissatisfied visitors. The speed with which a page loads can be a critical determining factor as to whether visitors may (or may not) commit themselves to lay down their credit card. When designing product pages, it is important to consider load speeds, particularly if there are large images, rich interactivity or other media in web pages. Very often, different product pages may clutter up web pages with excessive calls to action. These pages may contain customer photos, complicated pricing options, unnecessary details on customer support, too many reviews, et cetera. Without good web designs, these calls to action could easily blend into a confusing mess. While it may be tempting to utilise web pages with many actionable steps, the online sites should be as clear and focused as possible. A good call to action could include high-contrast buttons, call-outs and actionable elements which leave plenty of breathing room, to make them stand out. Online users might not be willing to commit themselves in buying products straight away. Therefore, businesses could entice visitors to fill in their subscriber list to receive exclusive offers, via email. This way, the businesses will be in a position to send newsletters and promotional material to their online prospects, at a later date. Businesses ought to facilitate their online purchase and transaction confirmation. A complicated funnel could deter the conversion of prospects. The customers who are in the businesses’ checkout page(s) should be allowed to finalise their purchase as quickly and efficiently as possible. If their customer experience of their online purchase involves an unnecessary effort to check out from the website; they may have second thoughts on the businesses’ quality of service. Therefore, users should not be distracted with anything that will take them away from the businesses’ purchasing funnel. It is important to let customers finish their transaction before taking them anywhere else on the website.